The Nyala drive is unfortunately a short one ... about 4 kms only. Yet on this short game drive the sights and sounds are splendid and wildlife exists in numbers as well as variety. 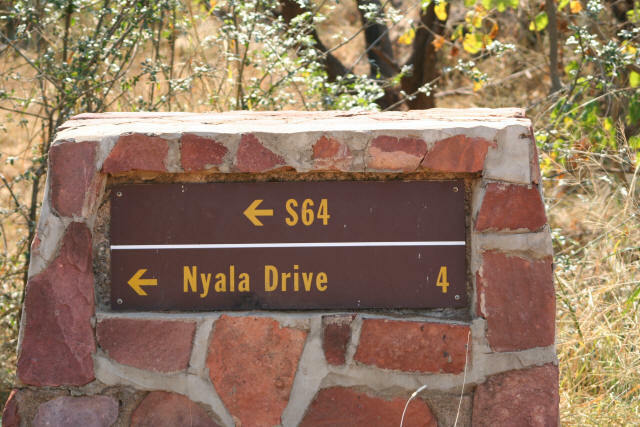 Of course the drive is aptly named since it allows you to get close to that rather scarce antelope, the Nyala. I have made the map of this drive quite detailed so you can see the variety of terrain crossed during the drive. It is a drive of magical forests, large mysterious and dry river beds, imposing sandstone cliffs, animals and splendid plant and tree life. Waypoint 033 (hidden partly behind 039) marks the spot where I turned off the H1-8. I followed the road to the right up to the dead end before turning around and leaving the loop behind upon rejoining the main road a 036 waypoint. You can see an aerial image of the general drive here. The first section of the drive goes through riverine forest before opening up somewhat. You'll get good views of the main Luvuvhu river on your right before skirting dense forest again that leads you down to a wide dry (when I was there) river bed. The river is called Ximuwana or Thambyi and is a tributary of the Luvuvhu. 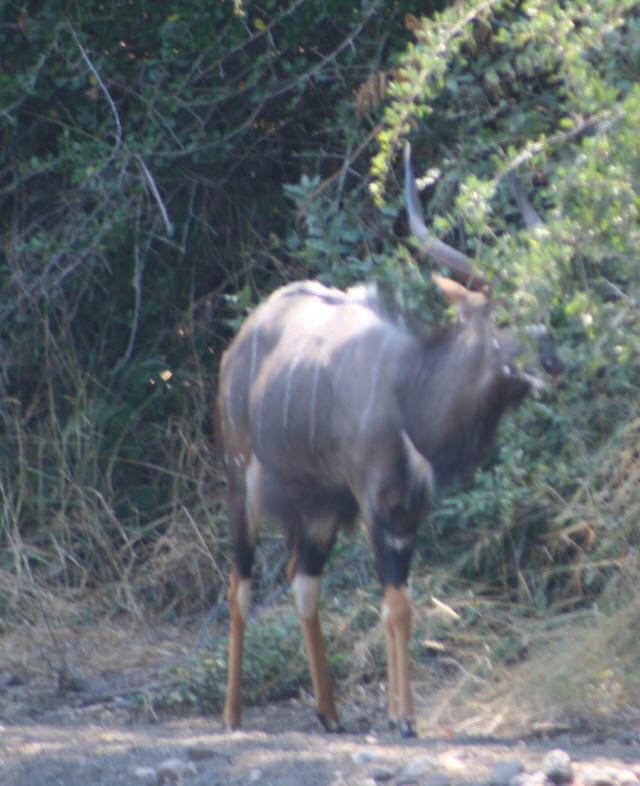 It was as I started crossing the dry river bed at the causeway that I saw my first Nyala. It was a fully grown bull and the photo does not do justice to its majesty. Shortly after driving out of the river bed you'll pass through enchanted forest again before coming to an opening. The ground to the left climbs gradually from around 300 metres on the road to 360 metres. 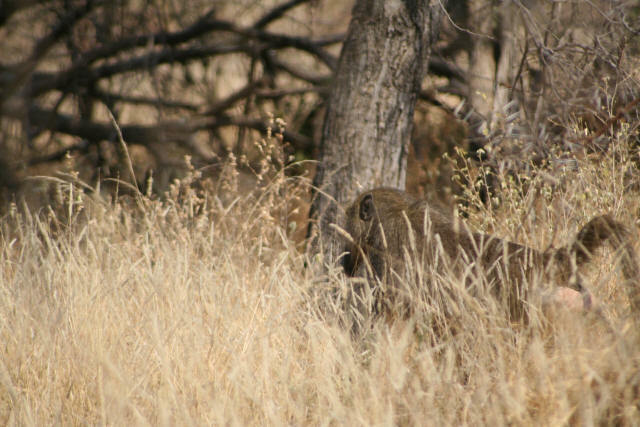 You'll see baobabs, flat topped thorn trees and numerous animals. 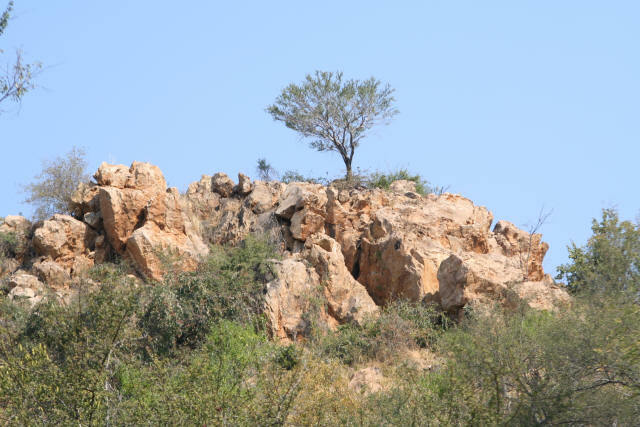 The yellow sandstone rock outcrop is a wonderful sight towering above the bush below. Shortly after this sight a small opening reveals a number of feeding Nyala both male and female. 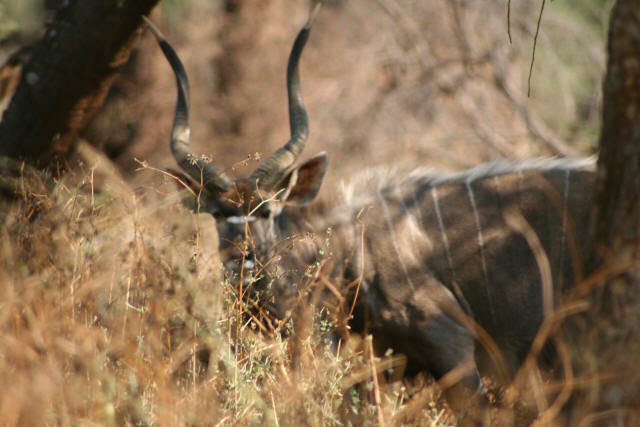 This image shows a male Nyala wondering what has disturbed his feeding. 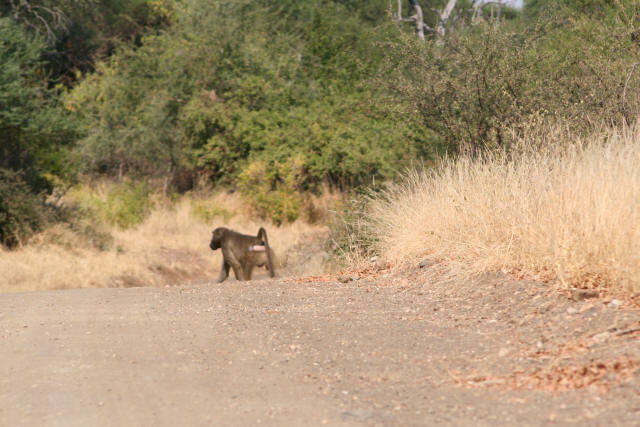 Baboons travel in large family troupes and are a common site throughout the Kruger National Park and almost always you'll see tiny large pink eared babies as part of the troupe. They can be very amusing to watch. A rich tapestry of colour and form is a continuous feature of driving the Kruger's roads. The animals, birds and wildlife galore are just a great bonus. This scene is close to the end of drive at waypoint 36. Before leaving the Nyala drive think of the history of this particular spot ... Thulamela Archeological site. 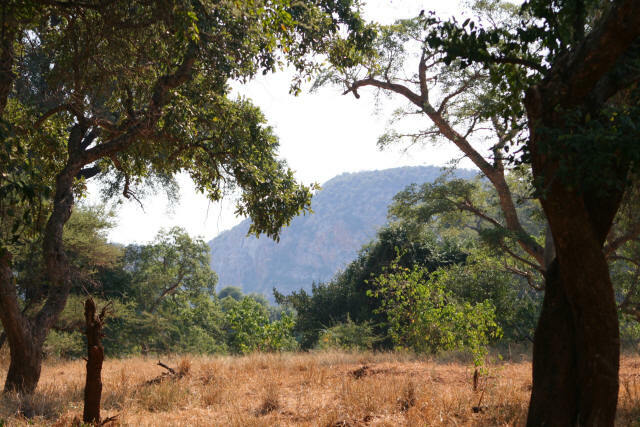 Half day trips can be arranged at Punda Maria camp where you are taken on a guided and guarded tour of Thulamela in the heart of Leopard country. Continue onwards to the Pafuri Picnic spot via the Luvuvhu loop road.